This years Franchise Council of Australia’s National Franchise Convention kicked off with a theme of ingredients for success, and it delivered! After what has been a rough 12 months for the franchise industry, the gathering of vendors, suppliers and franchise networks had a real sense of community. Keynote speakers, panels and round-tables had a noticeable focus on how we can work to support each other and the industry as a whole. 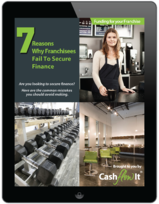 Many of those attending expressed a desire to renew franchising’s image in the media to reflect the positive success stories we see every day. The event was buzzing from its official opening on Sunday evening, with drinks and canapes throughout the exhibitor hall. The next two days saw a flurry of talks, panels, round-tables and of course networking. However, it was not all work, with many of the exhibitors offering up some great promotions including Cashflow It’s X-Golf Simulator, Soul Origins free coffee, and even a Hawaiian holiday up for grabs. The conventions line-up included some pressing issues affecting the industry, including franchisee profitability, corporate culture and dispute resolution. Cashflow It’s founder and director James Scurr talked on a panel discussing ‘Unlocking Franchise Finance’ alongside ANZ’s Tony Cotter and Finn Franchise Brokers’ Len Ferguson. The conversation explored the changing landscape of the finance industry for franchise owners and the impact of the Banking Royal Commission on lending standards. As well as this, alternative lending was a hot topic, in particular the risks and benefits of vendor financing and franchisee to franchisee financing. The session had some great take-aways including the important shift towards relationship based lending and the need for finance applicants to put their best foot forward on the first application. To cap off the convention, delegates and exhibitors alike ‘frocked up’ to enjoy the MYOB FCA: Excellence in Franchising Awards Gala. In addition to a great meal and an evening of entertainment, the gala saw many industry members receive their CFE , while others were recognised for their franchise brands success over the past 12 months. Cashflow It had the honour of presenting Laser Clinics Australia with the 2018 award for Emerging Franchisor Of The Year. Boost Juice, Hire A Hubby and Poolwerx also took out a string of awards on the night, recognition of the achievements and growth of both the franchisees and the network as a whole. We here at Cashflow It would like to say thank-you to the Franchise Council of Australia for once again facilitating the biggest event of the year of the franchise community.